When you hear that the market is up or down — on the car radio or around the water cooler — what does that really mean? 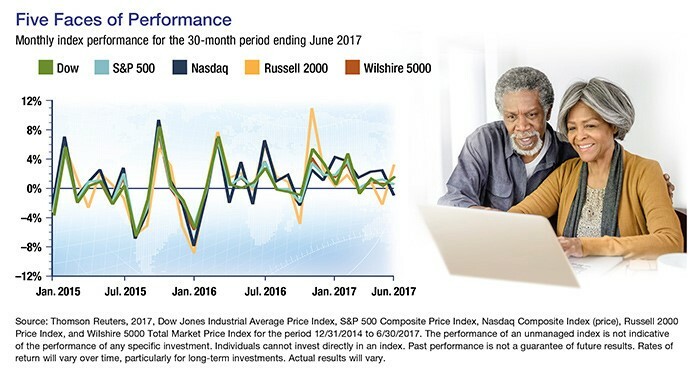 More often than not, it reflects movement in the two most well-known stock market indexes, the Dow Jones Industrial Average and the Standard & Poor’s 500, which tend to move more or less in sync. In fact, there are hundreds of indexes that track various categories of investments. Here are a few that are commonly cited and may be used as benchmarks for investments you own or are considering. Unlike the Dow, the following indexes are weighted based on market capitalization, the value of a stock’s outstanding shares. Market-cap-weighted indexes tend to be skewed toward the performance of the larger companies in the index. The performance of an unmanaged index is not indicative of the performance of any specific security, and individuals cannot invest directly in an index. Past performance is not a guarantee of future results. Actual results will vary. All investments are subject to market fluctuation, risk, and loss of principal. Shares, when sold, may be worth more or less than their original cost. Investing internationally carries additional risks such as differences in financial reporting, currency exchange risk, as well as economic and political risk unique to the specific country. This may result in greater share price volatility.